When should I change my brake pads? When should I change my rotors? How do I know when I need new brake pads on my vehicle? This is a commonly asked question - how do I know when to replace my brake pads? The answer to this question is actually pretty simple. When the brake pads start to make squeaking sounds, is the time to replace the pads. If you have noticed that you are having trouble slowing down or braking, it's probably a good idea to take your car to the mechanic sooner than later. I have a crunching sound coming from my front or back, when I apply the brakes. What is the crunching sound? 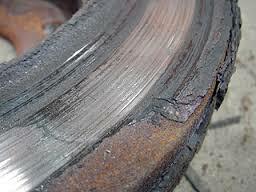 A crunching sound coming when you brake, could mean you need to replace the rotors on your vehicle. It could be brake pads, but likely rotors. Take your car to a local mechanic shop and have them check it out. You can also see visually yourself if you need to change the rotors, if you know how. Take a look where the caliper grabs the wheel. In between the caliper and the tire will be the rotor. If it looks really thin, or touching the metal, then you need to change the rotors. This is a very worn rotor. Notice how it looks like it's starting to fall apart - that's because it is. Once the rotors are ground down very thin like this, it's become time to replace them. When I'm driving and brake on the highway doing over 100 kmph or so, my wheel will shake and when I slow down I hear a "wob wob wob wob" sound. What is that? This is another clear indication that your rotors need to be changed. My ABS brake light came on in my car. What does that mean? What is wrong with my brakes? In some cars, the ABS brake light will come on when you need to replace a part. It may not always be the brakes themselves, but generally a critical part that makes the brakes work. When the ABS light comes on, don't take it lightly. Take the car to see the mechanic. Often times it is a part that is connected to a sensor, that will need replacement. It might be unsafe to drive with that part needing replacement. What does it cost to buy new rotors and pads? In my Chevy Malibu, I changed the brake pads every 6 mos - 1 yr. When I would get crunching sounds, or when my wheel would start to shake on the highway, I'd change everything. Often times it's best to change the brake pads at the same time you change the rotors. For $100 at the local car shop, I'd get the rotors for $50 and pads for $50. So for $100, I could change the brakes on the car. If you spend more, you'll get more premium brake pads, like ceramic pads that are supposed to last longer. A common question often asked by site visitors - when should I change my brake pads and rotors? In this review, we answer these questions. We include common reasons or symptoms when you need to replace your brake pads, rotors, etc.